I’m using SBT to build the project here. You just need to add some dependencies here to your build.sbt. "org.apache.camel" % "camel-velocity" % "2.10.3"
camel-scala: Adds the Apache Camel API, this is the minimum requirement for us here..
logback-core/logback-classic: Just some logging API, you may use your favourite logging framework here ..
greenmail: Allows us to create an embedded mail server that may handle all kinds of e-mail transfer. Some more detailed information can be found in my article “Integration Testing IMAP, SMTP and POP3 with GreenMail“. camel-mail: Adds support for handling e-mail messages in a route. Now that we’ve got every library we need let’s start to create some routes and play around with camel. The good thing is: You won’t encounter any problem using scala because the DSLs are 100% compatibel. In addition there are open source projects that take this goal further and provide additional syntactic sugar when using scala and camel together. One example is Camel Extras for Scala that adds some goodies like additional enhancements for the route builder or additional type converters for different scala types and collections. The first example is an easy one .. we’ve got two directories: data/inbox and data/outbox. Everything we’re putting into data/inbox is fetched by camel and put into data/outbox. 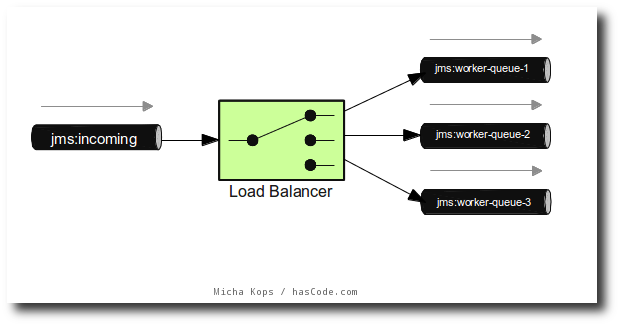 In the next example we’re going to do some JMS messaging using an embedded instance of ActiveMQ. The following route scans the directory data/inbox for incoming files. If there is a file it is put in a specific queue, filtered by the file extension. In addition we’re fetching the messages from alle JMS queues and print the processed file’s name. The resequencer allows us to bring our messages back in a predefined order .. e.g. you might want to resort incoming messages using the JMSPriority header or something like that. In our example, we have two queues .. wip and wip-inorder. What we’re doing now is to put some messages with a priority header into the wip queue and the resequencer orders messages from this queue and puts the messages in the correct order into the wip-inorder queue. Some more detailed information can be found at the Camel website: Resequencer. 16:10:02.555 [main] DEBUG o.a.c.m.DefaultManagementAgent - Registered MBean with ObjectName: org.apache.camel:context=styx/camel-1,type=endpoints,name="jms://wip-inorder"
Camel offers you an easy way for load balancing using different strategies. We’re using an easy round-robin strategy here without any special configuration. There’s a lot of useful information on possible configuration and load balancing strategies on the Camel documentation. Running the example above could produce a similar output – but it is not guaranteed.. In the next example we’re setting up an email server using the greenmail library – if you’re interested, please feel free to take a look at my tutorial “Integration Testing IMAP, SMTP and POP3 with GreenMail“. Afterwards we’re setting up a camel route that fetches e-mails from this IMAP server and stores them in the directory data/outbox. 22:02:44.298 [Camel (camel-1) thread #0 - imap://joe@0.0.0.0:3143] DEBUG o.a.c.component.mail.MailConsumer - Fetching 3 messages. Total 3 messages. In the following simple example we’re just scanning the directory data/inbox for incoming files. When a file is added to this directory, a velocity template is applied to create a new file. This is the application and the route binding. Camel allows us to use POJOs to specify and endpoint or handle further processing instructions. This is our recipient bean .. depending on the file name extension it returns two possible JMS queues used for further processing. And this is our application that scans the directory data/inbox for files and delegates the flow to the recipient bean. In addition we’re scanning both JMS queues for new messages and we’re printing the file names received from their messages. When we’re now adding some files to the directory ..
21:04:06.741 [ActiveMQ Journal Checkpoint Worker] DEBUG o.a.a.store.kahadb.MessageDatabase - Checkpoint started. 21:04:06.753 [ActiveMQ Journal Checkpoint Worker] DEBUG o.a.a.store.kahadb.MessageDatabase - Checkpoint done. This entry was posted on Wednesday, February 13th, 2013 at 9:09 pm	and is filed under Enterprise, Scala, Web Services. You can follow any responses to this entry through the RSS 2.0 feed. You can skip to the end and leave a response. Pinging is currently not allowed. I enjoyed reading this tutorial on the Camel DSL and how you build an application using the EIP patterns. Excellent article! Your examples are concise and straight to the point. I hope to read more from you. The context-based route example looks very much like the example from “Camel in action” :-) I have a question regarding this: In the book, another endpoint is chained after the CBR by adding .to(“jms:furtherProcessing”). When using the Java DSL, this works nicely; but I haven’t managed to get it working with the Scala DSL, the furtherProcessing queue never receives any messages! Any idea how to get this right? Did using “end” on the choice not work for you? I’ve written this one up for you – is that what you were searching for? Hi micha, thanks for your reply! end? *smackshead* I assumed that would be implicitly done by the closing curly brace of the choice statement. Ok, found the difference: I didn’t explicitly use from(..), but only the string representation of the endpoint. This works for simple from..to-expressions, but didn’t give the “end” method.